Redbubble was expanding into several new markets and quickly gaining thousands of new subscribers. It was time to create a comprehensive narrative to introduce new users to a clear brand narrative. Strategy: We created a cohesive, data-driven onboarding flow that still reflected the brand's personality. A new template was implemented including modules and a footer navigation that encouraged users to explore the site beyond the main messaging in the email. We were able to engage users in a more thoughtful manner with the cadence of the emails as well & configuring the most optimal flow. All of which resulted in incremental revenue of 120% YoY. My role: Art direction and UI/UX design. The goal was to create a clear flow and merge the various legacy communications that were being sent to new users. An audit revealed that several messages were being repeated without a clear direction or cadence. 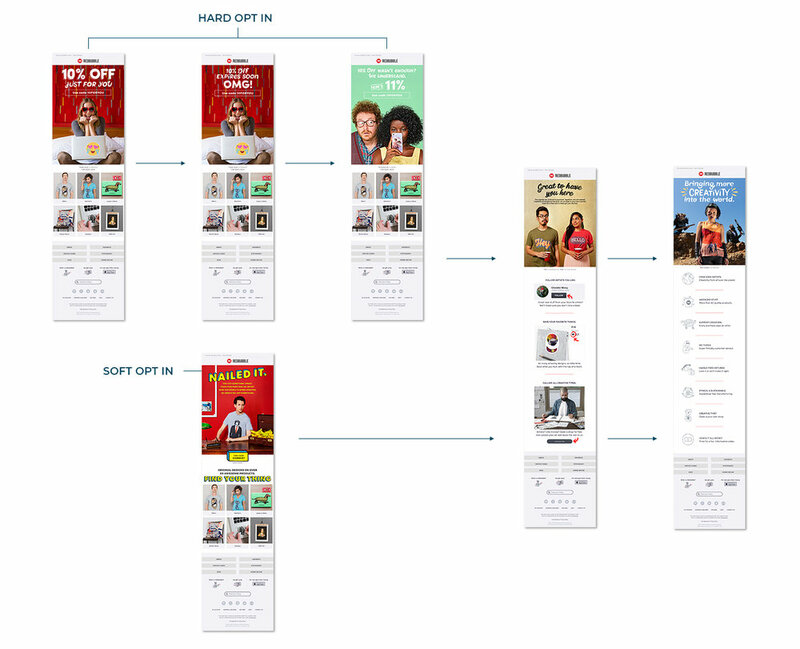 The final on-boarding flow was divided into hard and soft opt ins, and cadence was directed by the users engagement. We took the opportunity to inject the brand voice and visuals by integrating our photography and illustrations rather than a plain block of text. Emails dedicated to the education about the brands mission, account perks, sustainability, etc. were scheduled in. In this email, we took the opportunity to highlight features that made the client unique from both commercial retailers and competitors.. Educating new users on the company’s values and perks, grows brand recognition and loyalty. A more visually distinctive footer navigation was added which showed a 25% increase in click through rates compared to the header nav. In addition to this, a series of illustrations were used highlight 3 features in collaboration with the product and brand team. This aided in increasing the number of iOS app downloads (alt versions were provided for non iOS users). All designs were optimized for mobile and desktop.